Would you like a bit of ironic elegance in your home decor? No problem, thanks to Je t'aime (pour tojours), a brand created by Francesco Brandi and Alessandro Innocenti, respectively an architect and a designer. They started a project mixing tradition with innovation, sense of humor and emotions. All with unmistakable elegance. How was Je t'aime (pour tojours) started? Francesco: From my passion for design, decor and French-romantic furnishing style. Everything started, a bit for fun, when I began working on something which fascinated me for a long time: a metal table clock, the so-called parisienne. An object that usually decorated mantelpieces in the elegant halls of XVIII century. I decided to reinterpret the original design following current interior design trends, with a smaller and more flat shape recalling another typical theme of those times: the silhouette. This gave me the idea to make the clock by carving, like it happened for paper cutouts, but with laser-cut and alternative materials such as plexiglas or metal. And how was the final result? Francesco: In this new parisienne, the romanticism and evanescent refinement of XVIII century taste are combined with contemporary stylistic features and a bit of provocative irony. 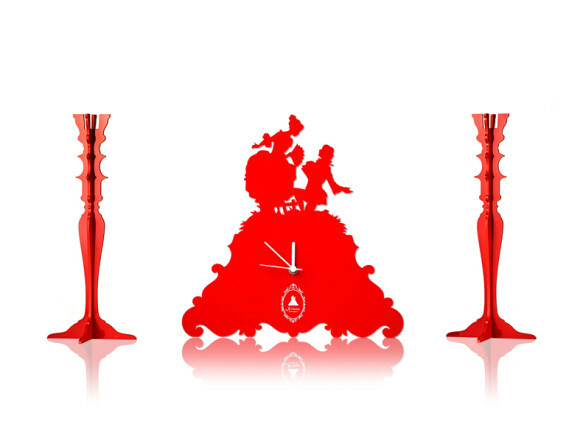 That's how Je t'aime (pour toujours) was born: a table clock showing a traditional love declaration, with one lover down on his knees in front of his beloved. Of course, a clock shows a specific instant in time but also its eternal flow, in this way suggesting an ambiguous interpretation of love's ability to last. And then, after this new parisienne? This first project triggered a creative process that gave life to an actual furnishing complement line, always changing, called exactly Je t'aime pour tojours, which now is a registered trademark. The Bougeoir candlestick, another object which usually was a part of XVII century mantelpiece compositions, and Her Majesty mirror, another big protagonist of our collection. 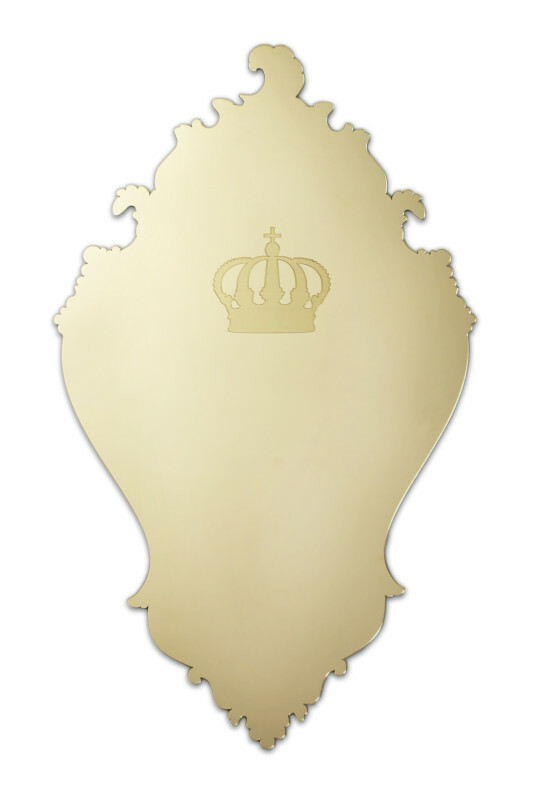 Her Majesty is made in water-cut glass, after a first series made in plexiglas, and it recalls the outline of an old mirror with a decorated frame. It's embellished with the shape of a sandblasted royal crown in the center of the reflecting surface. In this way, who's looking in Her Majesty sees his/her reflected image with a crown on his/her head. We wanted to create an elegant, but at the same time cool, object in which past and present, irony and romanticism mixed together. Alessandro: During last Fuorisalone, in Milano, both professionals and general public welcomed Her Majesty. We also went around Milano with our mirror literally in our arms, offering a royal selfie to the people we met. A lot of them had fun with a "crowned" photo. Which kind of relationship do you have with Makers? Francesco: We are most of all designers, so we feel we are Makers in a broad sense. We are "conceptually makers" of our work but then we turn to who has the technologies to make it real and actually manufacture our products. Francesco: To diversify our brand as much as possible, first of all for interior design. At the moment we're working on textile patterns for pillows and lampshades; the first prototypes have been greatly appreciated. Then home fragrance dispensers: we already designed "Je t'aime (pour tojours) N°1" parfum de maison. Also, we'd like to make our offer wider, with more colors and finishings and introducing pastel colors and chrome plating. Who could be the perfect testimonial for your products? Someone like Paola Marella, interior design TV guru on Real Time and an icon of style. She would for sure admire a glamour and elegant object such as Her Majesty.